At Apex Scaffolding, we have over 25 years experience of erecting scaffolding throughout the Preston area. Jones Homes - Scaffolding for new build construction of small housing development at Riley Street, Preston. NW Pumps - Confined spaces scaffolding for underground rainwater relief tanks for Preston area. 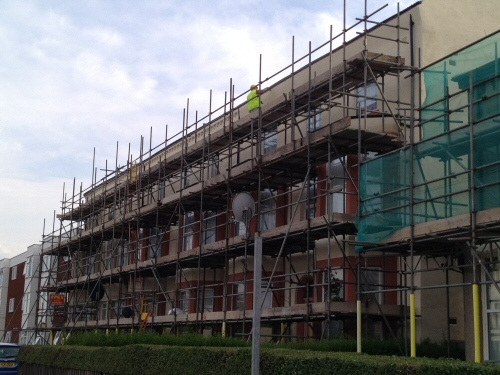 James Carter Homes - New build scaffolding for bespoke one-off property at Lea Lane. 360 Signs / New Look - Internal birdcage scaffolding to access lights and escalator mechanics at St Georges Shopping Centre store. Roger Eaves (Builders) - Tube and fitting scaffolding for construction of a new lift shaft and access for engineer, plus exterior refurbishment of office building in Winckley Square. Marshall (Building Contractors) / Aldi - New build scaffolding for the construction of a new Aldi supermarket in Garstang. Subway, Garstang - Exterior and interior scaffolding for shop extension and conversion to a Subway. Volker Fitzpatrick - System scaffolding for the construction of accommodation block at Preston Barracks. Preston Royal Infirmary - Edge protection to the staircases, lift shafts and all steelwork during the construction of a three storey building by Conlon Construction Ltd. Steam Laundry, Blackpool Road - External scaffolding to allow for remedial works by John Barnes & Sons Ltd.
Ribby Hall, Wrea Green - Numerous contracts during the ongoing development and maintenance of the site. Ali Raj Indian Restaurant - External scaffolding during conversion of premises from a pub to a restaurant. Ark Construction (NW) Ltd - Refurbishment and extension of the Welcome Tavern, Walton-le-Dale. Fylde Joinery & Building - Temporary roof for conversion of domestic bungalow to a house on Egerton Road, Preston. We have a highly Trained and Accredited Workforce and offer a safe, quality scaffolding service at a competitive price. If you're looking for experienced scaffolding contractors for a larger domestic or commercial project, give Apex Scaffolding a call.